What could be more creepy than a pile of dirt full of bugs and worms? 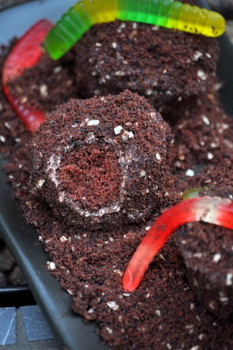 Maybe the boogie man, but this year I used that idea as inspiration to create some Dirt Cupcakes as a Halloween treat! Like many Halloween treats, they taste a lot better than they look and they’re a lot of fun to make. These cupcakes start out with a big batch of devil’s food chocolate cupcakes. Once the cakes were baked and cooled, I sacrificed a few of them to the food processor to pulse them into “dirt” crumbs to top the rest of the cupcakes. I made a chocolate buttercream frosting and covered the top and sides of each of the cupcakes – removing the wrappers after the cupcakes were completely cooled to keep them from sticking – then rolled the cupcakes in the “dirt” to coat them. They look good once they’re coated, but when you dress up the serving plate with a little bit of leftover “dirt” and a bunch of gummy candy worms and bugs, you get a batch of deliciously chocolatey cupcakes that are almost too creepy to eat! If you decide to dig in, you’ll find that the cakes have a great chocolate flavor and are nice and moist inside. If you prepare the cupcakes shortly before serving, the “dirt” crumbs will be nice and moist (my favorite time to eat them), but you could prepare them a couple of hours in advance and let them sit out, too. The cupcakes themselves can (and should) be prepared the night before, cooled then and stored in an airtight container before you start to assemble them. These cupcakes are a bit messy to eat. There are crumbs everywhere and frosting on your fingers and lips. But I know that I can remember a time when playing in dirt was a fun thing to do and this is one time when I definitely feel the same way! Preheat the oven to 350F and lightly grease two 12-cup muffin tins (24 muffin cups total) or line with paper liners. In a large bowl, cream together butter and sugar until light. Beat in eggs one at a time, followed by buttermilk and vanilla extract. Add half of flour mixture to the butter mixture, followed by the chocolate mixture, followed by the addition of the rest of the flour mix. Stir well between each addition and mix just until no streaks of flour remain. Combine all ingredients in a large bowl and beat, with an electric mixer, until frosting is creamy, 3-5 minutes. Add additional powdered sugar as needed to achieve a thick, but not stiff, frosting that is easy to spread. Add additional milk, if necessary, to thin the frosting if it gets too thick. Take five of the cooled cupcakes, remove wrappers and place in a food processor. Process until the cupcakes are reduced to fine crumbs. To give the “dirt” some texture, you could add a small amount of cocoa powder, chocolate or shredded coconut. Transfer “dirt” to a large bowl. Remove wrappers from remaining cupcakes (if using wrappers) and lightly frost the top and sides of all cupcakes. Roll cakes well in “dirt” to coat, then set on a wire rack to allow frosting to set up slightly. Garnish serving plate with leftover “dirt” (process 1-2 additional cupcakes if you want to ensure that you have plenty of “dirt”) and gummy worms and bugs. What a great idea! and I love the gummy worms wriggling through your “dirt”. Sounds perfect for a spooky Halloween party. thank you for a great clever way to serve those gummy worms and not become an addict over gory desserts!!! So cute! These are my all time favorite! I remember having them in preschool..ever since then they’ve brought me back. 🙂 Thank you! 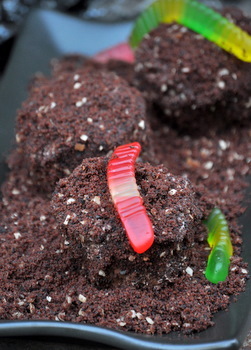 i used to love those dirt desserts when i was a kid with pudding and oreo crumbs, these look fun! Fun! I love gummy worms. Any vehicle for gummy worms is good!